Oh boy, the legacy of 80s urban fantasy has returned and is thriving in City of Bones, a splendid new novel from Cassandra Clare. The novel features a young woman, Clary, who is about to learn that the NYC that she thought she knew has a second, hidden world existing secretly around it. Clary witnesses three teens apparently murder another teen -- but the body disappears, swallowed in a black shadow. The three teens, it turns out, are Shadowhunters (an ancient race of human and angel) who hunt the renegade demons, vampires, and werewolves of the underworld. But the fact that Clary can see them suggests that she too is something more than just a "mundie" (a mundane human). The plot quickly thickens like good broth as Clary's mother Jocelyn disappears -- either kidnapped, or on the run. Clary learns that Jocelyn has her own secret history with the Shadowhunters, including knowing the whereabouts of the "Mortal Cup" -- a powerful, magical cup used to turn humans into Shadowhunters. A renegade Shadowhunter is searching for the cup to create his own army with which to eliminate any nonhumans -- including even benevolent werewolves, vampires, and demons. (The story develops an interesting subtext on issues of racism and fear of "otherness.") Clary must quickly adjust to these events -- re-learn who she is, develop skills as a Shadowhunter, and find the cup to keep it safe. This novel is so much fun to read! Fast-paced, funny, dark, and exciting. Clare has dipped her pen in the deep resources of fairy lore and epic tales, and has her ear well tuned to the teenage voice. The plot is tight, twisting, and full of surprises. 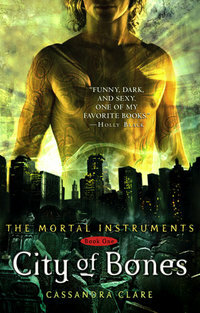 City of Bones is the first of a series -- The Mortal Instruments -- and it promises great things to come. Do check out the Mortal Instruments website -- it's fabulous, filled with extras, news, art, and updates on the series. i love this book i read it like 15 times already i no every word!